The beauty of social networks are obvious. The problems, of course, are many. Finding friends across multiple networks is a pain that’s probably foremost in a lot of people’s minds. 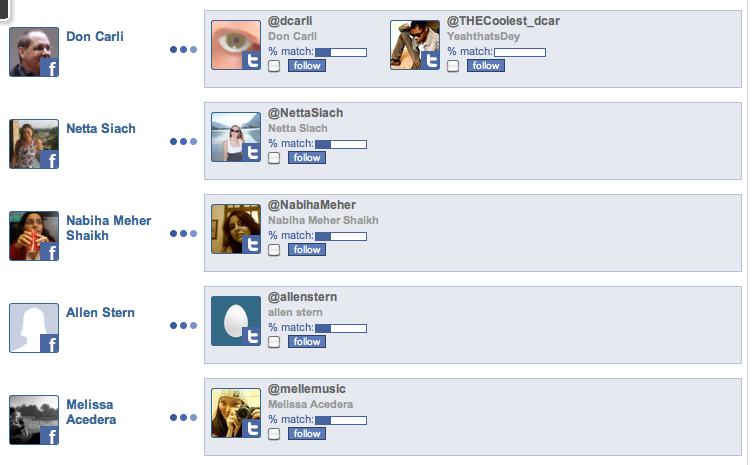 Twitter has tried to create ways for you to find your Facebook Friends, but Facebook wasn’t so keen on the idea. Since then, we’ve seen lots of problems trying to mesh the two. FriendLynx is a Facebook application that does its best to find your Facebook friends on Twitter via name searches. It does put the FilterTweeps system to work, so it should search through some 11 million people. Once you load, you simply give authorization via Twitter and Facebook (on the same page) and Friend Lyncs goes to work. The question, of course, is does it work? The answer is yes. Sort of. The other advantage that we like to see is that, in finding these friends, you can then easily create lists of your Facebook friends on Twitter. The developer, Alfredo Artiles, says that it can also help your Twitter friends to find you on Facebook. Our results were a mixed bag. Zee had good luck with it, while Adam and I didn’t. However, Adam noted that if the application errors the first time through, a reload should fix things. There is, of course, the issue of privacy controls. If someone is set to not be found, then they’re simply not going to be found. So, for now, it’s at least an option that’s great to try. Let us know your results in the comments.